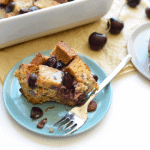 It’s cherry season and time to spruce up a classic breakfast! 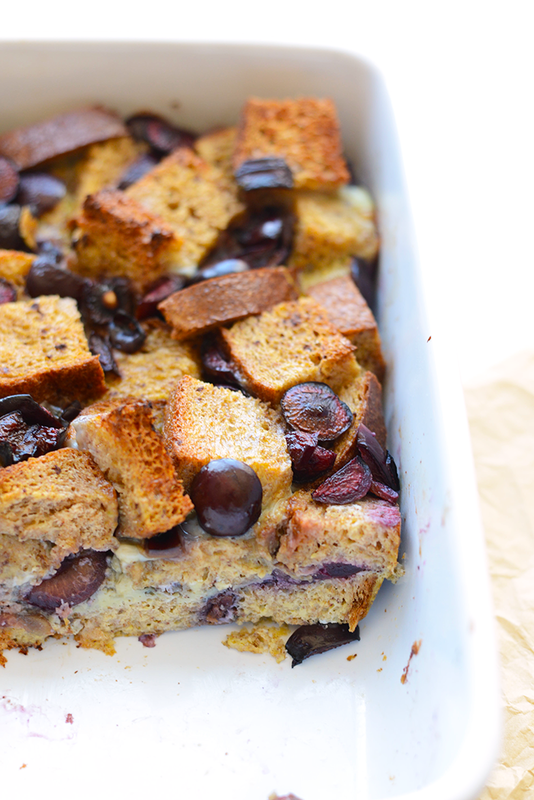 Make this cherry french toast bake for an easy morning casserole the whole family will love! Speaking of the schedule feature. Did you know that every single blog post I write is scheduled out? 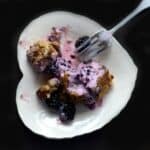 A lot of people think I get up at 4AM every morning to post a new recipe. HAAAAA. False. I hit a button a week or two before that sends things out through cyber space straight to your inbox. I wake up the next morning and voila. 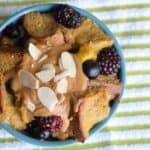 So this French toast bake is about to be your best friend. I am a lover of all things cherry, especially if it involves a Smackers lip balm flavor. I was totally that girl who collected (collects) lip gloss. To this day, I bet I have over 30 chap sticks/lip glosses just laying around. I got a giant bag of cherries from Lunds and Byerleys, one of my favorite grocery stores in the twin cities, and was super pumped to make some baked French toast! This has to be one of the easiest recipes on the planet. All you need to know how to do is pit a cherry, cut some bread, and whisk some eggs. You’ll also need to know how to turn your oven on, but freal, if you don’t know how to do that, we got issues. The hardest part of this recipe is waiting the 40 minutes for this bad boy to cook all the way through. The top gets a little crispy. I’m salivating just thinking about it. Preheat oven to 375ºF and spray a casserole dish with coconut oil cooking spray. Slice 12 pieces of bread into bite size pieces by slicing into thirds, turning 90 degrees, and slicing into thirds again. Set aside. Prep cherries, by pitting and dicing. Place half of the bread pieces on the bottom of the casserole dish. Then, sprinkle on half of the cherries. Place the rest of the bread on top and then sprinkle the rest of the cherries on. 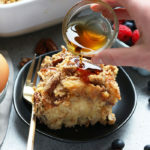 Create your egg mixture by whisking together 8 large eggs, ¾ cup almond milk , 2 tablespoons maple syrup, 1 teaspoons cinnamon, and 1 teaspoon vanilla extract. Once combined, evenly pour mixture on top of bread and cherries. Using your hands, press bread down into the egg mixture to moisten as many pieces as possible. If the top are sticking out of the egg mixture, this is okay! Bake at 375ºF for 35-45 minutes. 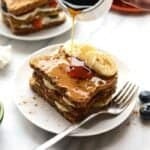 Check the center of french toast bake at 35 minutes and then every 5 minutes from there. You’ll want the egg mixture to be firm and cooked all the way through. Note: the cook time depends on how deep your casserole dish is. Are you a lip gloss hoarder? Please say you are.